Atoms can be labeled to show charge values. Add Charge assigns atomic partial charges and Amber/GAFF atom types as the attributes charge and gaffType, respectively. Atoms in standard residues (water, standard amino acids, standard nucleic acids, and a few common variants and capping groups) are assigned charges and types from Amber (details...). Except for monatomic ions, which are simply assigned their net charges, atoms in nonstandard residues are assigned charges and types determined by Antechamber, which is included with Chimera (details...). Atomic partial charges (and optionally, Amber/GAFF atom types) are included in saved Mol2 files. The charges and Amber/GAFF atom types are used by other Chimera tools such as Minimize Structure. There are several ways to start Add Charge, a tool in the Structure Analysis and Structure Editing categories. Add Charge is also implemented as the command addcharge. Models to process can be chosen from the list with the left mouse button. Ctrl-click toggles the status of an individual model. To choose a block of models without dragging, click on the first (or last) and then Shift-click on the last (or first) in the desired block. Some subset of the atoms could be specified with the label command, whereas the above would label all displayed atoms. OK initiates processing and dismisses the dialog, Apply initiates processing without dismissing the dialog, and Close simply dismisses the dialog. Help opens this manual page in a browser window. AddH will be called as needed to add hydrogens. Potentially ambiguous or rare (shifted-pKa) protonation states, especially in binding sites and nonstandard residues, should be verified and corrected before charges are assigned. For example, extra hydrogens can be deleted, and atom types can be edited (before hydrogen addition) with setattr or Build Structure. If there are any nonstandard residues, a dialog will appear for specifying their net charges. Names of the form RES1+RES2 indicate covalently bonded residues that will be treated as a single unit, and the net charge is for the combined entity. The charge calculation method can be changed at this point, if desired. If a nucleic acid chain has a 5' terminal phosphate, the user will be asked whether this group should be deleted; otherwise, its atoms will be assigned charges of zero (the charge sets lack parameters for 5' phosphates). A warning will appear if the name of any atom in a standard residue is not recognized or a model's net charge is not an integer; details will be reported in the Reply Log. Cases of unrecognized atoms in standard residues and/or incorrect net charges should be examined and resolved. Note that chain-terminal nucleotide residues will normally have non-integral charges, but the 5' and 3' charges sum to an integer. Atoms in standard residues (water, standard amino acids, standard nucleic acids, and a few common variants and capping groups) are assigned charges and atom types taken from Amber parameter files. Precalculated charges are also used for ATP, ADP, GTP, GDP, NAD, and NDP, as described below. D.A. Case, V. Babin, J.T. Berryman, R.M. Betz, Q. Cai, D.S. Cerutti, T.E. Cheatham, III, T.A. Darden, R.E. Duke, H. Gohlke, A.W. Goetz, S. Gusarov, N. Homeyer, P. Janowski, J. Kaus, I. Kolossváry, A. Kovalenko, T.S. Lee, S. LeGrand, T. Luchko, R. Luo, B. Madej, K.M. Merz, F. Paesani, D.R. Roe, A. Roitberg, C. Sagui, R. Salomon-Ferrer, G. Seabra, C.L. Simmerling, W. Smith, J. Swails, R.C. Walker, J. Wang, R.M. Wolf, X. Wu, and P.A. Kollman (2014), AMBER 14, University of California, San Francisco. Improvements in ff14SB relative to ff99 versions include dihedral corrections for proteins and updated parameters for nucleic acids. New-generation amber united-atom force field. Yang L, Tan CH, Hsieh MJ, Wang J, Duan Y, Cieplak P, Caldwell J, Kollman PA, Luo R. J Phys Chem B. 2006 Jul 6;110(26):13166-76. A point-charge force field for molecular mechanics simulations of proteins based on condensed-phase quantum mechanical calculations. Duan Y, Wu C, Chowdhury S, Lee MC, Xiong G, Zhang W, Yang R, Cieplak P, Luo R, Lee T, Caldwell J, Wang J, Kollman P. J Comput Chem. 2003 Dec;24(16):1999-2012. Molecular mechanical models for organic and biological systems going beyond the atom centered two body additive approximation. Cieplak P, Caldwell J, Kollman P. J Comput Chem. 2001 Jul 30;22(10):1048-57. Strike a balance: optimization of backbone torsion parameters of AMBER polarizable force field for simulations of proteins and peptides. Wang ZX, Zhang W, Wu C, Lei H, Cieplak P, Duan Y. J Comput Chem. 2006 Apr 30;27(6):781-90. A second generation force field for the simulation of proteins, nucleic acids, and organic molecules. Cornell WD, Cieplak P, Bayly CI, Gould IR, Merz Jr KM, Ferguson DM, Spellmeyer DC, Fox T, Caldwell JW, Kollman PA. J Am Chem Soc. 1995 May;117(19):5179-97. Refinement of the AMBER force field for nucleic acids: improving the description of α/γ conformers. Pérez A, Marchán I, Svozil D, Sponer J, Cheatham TE 3rd, Laughton CA, Orozco M. Biophys J. 2007 Jun 1;92(11):3817-29. Comparison of simple potential functions for simulating liquid water. Jorgensen WL, Chandrasekhar J, Madura JD. J Chem Phys. 1983 Jul 15;79(2):926-35. Note different solvent charge sets can be obtained using Solvate. Charges previously assigned to solvent atoms by Solvate are not overwritten by Add Charge. However, Minimize Structure will still use the TIP3P model for the remaining water parameters. While both methods are much faster than ab initio calculations, the Gasteiger method is the faster and more approximate of the two. Note that Antechamber/GAFF are meant to handle most small organic molecules, but not metal complexes, inorganic compounds, or unstable species such as radicals, and may not work well on highly charged molecules. 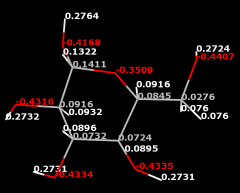 GAFF allows for parametrization of most organic molecules made of C, N, O, H, S, P, F, Cl, Br and I. Automatic atom type and bond type perception in molecular mechanical calculations. Wang J, Wang W, Kollman PA, Case DA. J Mol Graph Model. 2006 Oct;25(2):247-60. Development and testing of a general amber force field. Wang J, Wolf RM, Caldwell JW, Kollman PA, Case DA. J Comput Chem. 2004 Jul 15;25(9):1157-74. Attribute assignment. Charges can be specified arbitrarily in a simple text attribute assignment file, read in with Define Attribute or the command defattr. PQR. The PQR variant of PDB format includes atomic partial charges and radii, which Chimera assigns as the atom attributes charge and radius. Mol2. When a structure is read from a Mol2 file, the atom types and any partial charges are stored as the atom attributes mol2type and charge. PubChem SDF. When a structure is read from a 3D SDF fetched or obtained directly from PubChem3D, values in the section marked <PUBCHEM_MMFF94_PARTIAL_CHARGES> are stored as the atom attribute named charge. Topology files. Partial charges in some of the topology formats (Amber, PSF) input to MD Movie are stored as the atom attribute named charge.